Update #2: Looks like I’ve been banned from Dropbox for excessive bandwidth. Download links has been updated. Let’s hope Bitbucket won’t mind the traffic…..
Update #3: New download links added. I sincerely apologize about that. Finally, here it is: the first public release of Powerslave EX. Download link can be found at the downloads page. I have also added a FAQ page as well which should answer everyone’s questions. I would also like to thank everyone who volunteered to play test it and helped identify all of the major issues. Also, included in the package is a addons folder which contains some example mods that you can use. Instructions to use them are provided in the package. This release is by no means perfect; there will be bugs and lots of other issues that may pop up. Please report any bugs and flaws to kexenginebugsgmailcom. Expect to see patches for this initial release being announced. Sometime in the future I will be writing up a technical documentation on the console versions of Powerslave and how the game worked as well as document its renderer. 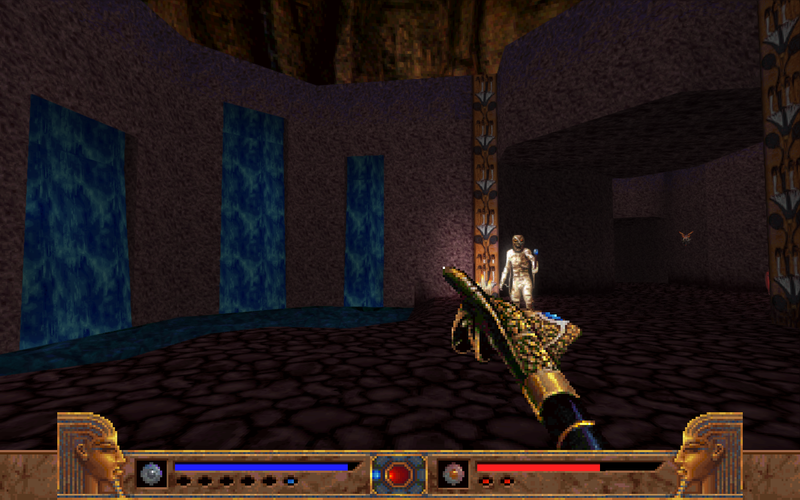 I will also be releasing the source code for Powerslave EX sometime in the future as well. So what’s next? Fixing bugs of course. Tools and extended modding support are also on my to-do list as well as supporting the Saturn and PC versions of the levels. Feel free to ask any questions regarding to modding the beta release on this post. So here you have it, Powerslave EX. If you ever see this, I’d really like to hear what you guys think about this project. Any feedback is greatly appreciated! Also, something that I would really like to do in the future is implement a commentary system. If you guys are interested in providing your stories and experience on this game then definitely I would like to hear from you! hey… how much we have to wait? I hope You didnt have problems with the copyrights….it could be awful, this game deserve to be back ! i don’t know what could be the point about killing a fanproject of a game where the pc version is abandoware and the ps1 version not even in the PSN….. I could be so happy if people make maps with the tools You wanted make ? Hard to wait, i like a some some nextgen fps, but i want a fps like Exhumed to be back, to show how fps can be deep and beautiful too! Thx for your work. Is there a way to change the texture filtering from “Nearest Neighbor” (Blocky) to “trilinear” (Smooth) This is an excellent port and the only issue I have is that I can’t smooth the textures and sprites. I tried the GL-Filter comand and tried “1” & “2” and even tried typing in “Bilinear” and “Trilinear” as options but alas, only nearest neighbor texture and sprites are shown. If anyone knows how to smoothen the sprites and textures, please reply to this message.